This recipe for a healthy banana and chocolate shake is the reason that you should always have a few bananas in your freezer. When we have some bananas that are starting to get a little soft and brown at the edges we never throw them out as most people would do. We just peal the ripe bananas, bag them in a plastic bag and freeze them so that they can be used at a later point – and by that saves some money from buying new ones. A frozen banana can be used for many different things like these healthy homemade banana pancakes – they are one of our most popular recipes. This recipe for a shake with bananas and chocolate is super delicious, it only consist of four different ingredients and it takes about 5 minutes to make! 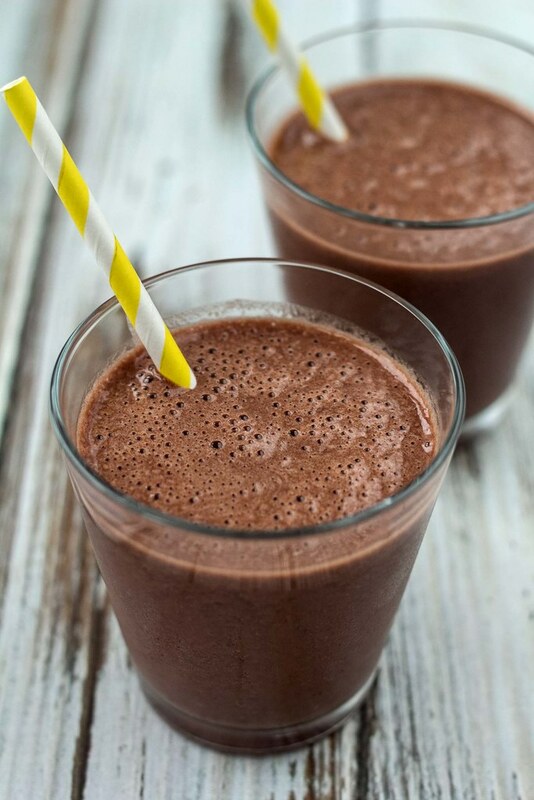 The frozen bananas gives the shake a nice, smooth and cold consistency and the cocoa gives it a delicious chocolate taste and color. If you want to add more sweetness to the shake think about adding a table spoon of date syrup or honey. This shake is perfect to be served right after a workout at the gym or maybe just as an late afternoon drink before dinner. When you have tried this shake, or the banana pancakes, you will never throw out bananas any more just because they are a bit brown, you will save them in the freezer. This shake is super easy to make and very delicious, we hope you will try it. If you are looking for a good afternoon snack consider a slice of this delicious bread topped with a slice of cheese or ham. The bread has 6 different kinds of grains, seeds and nuts and are really healthy and filling. Step 1: Mix all the ingredients in a blender and blend until it has a nice and smooth consistency. Step 2: Pour the shake in one large glass or two smaller and drink it when it is still cold. Tip 1: When you are done using your blender, you can follow this guide how to clean it in under 60 seconds. Tip 2: Serve this cold shake as an snack before dinner or after a workout.